Rev. Carol Howard Merritt is a minister whose writing, speaking, and teaching is anchored in theological wisdom and sociological insight. She’s a sought-after keynote speaker, especially on the topic of ministering in a new generation. The award-winning author of Tribal Church: Ministering to the Missing Generation,Reframing Hope: Vital Ministry in a New Generation, and Healing Spiritual Wounds: Reconnecting with a Loving God After Experiencing a Hurtful Church. Carol is a frequent contributor to books, websites, magazines, and journals. She is a regular writer at the Christian Century where her blog is hosted. Carol is an Adjunct Faculty member at Dubuque Theological Seminary and a Senior Consultant at Center for Progressive Renewal. She is a founder and host of UNCO, an open-space “unconference” that attracts church leaders across denominations and generations. Since 2011, a growing community of participants meets to generate ideas and develop plans for​ ministry. 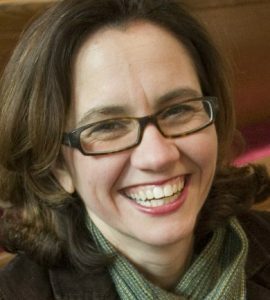 She co-hosts the thought-provoking podcast, God Complex Radio, with Rev. Derrick Weston. When not at a podium, pulpit, or an airport, Carol can be found in Chattanooga, Tennessee with her pastor-activist husband, Brian Merritt, and their daughter, Calla.